Albatross by R.A. MacAvoy and Nancy Palmer. By Lis Carey: Dr. Rob MacAuley is a brilliant physicist from the Outer Hebrides. He’s also on the run, convicted in absentia of terrorism and murder. It’s an absurd charge against a gentle and largely apolitical man, but it’s a symptom of a Britain grown ever more paranoid, that has split from the EU at a cost its leadership could have calculated but didn’t, and where the Scottish Parliament was dissolved eighteen months ago. Rob is, through no fault of his own, a figurehead, or perhaps mascot would be a better word, of the Scottish Separatist movement. Oh, and he has this odd thing he does, when startled or alarmed, that he calls “flinching,” and that someone else might call moving from one spot to another without crossing the intervening distance. Thomas Heddiman, American, machine intelligence specialist, anti-human trafficking activist, and karate expert, has a whole different set of problems. He’s currently volunteering his services to the Edinburgh police for reasons not apparent to those he’s working with. Their paths are about to cross in a most unexpected way, in a Britain growing increasingly dark. Thomas is very close-mouthed about what his real purpose is. Rob is sending letters under false names to physicists all over the world, asking questions that he hopes will nudge them toward the same breakthrough he’s made. He doesn’t want to be the only one who has the ability to publish and share his Unity Theory, so that it at least can’t become a weapon for just one power. This is an engaging and challenging book, with diverse and fascinating characters. The time is just about a quarter century in the future, and it’s a recognizable but different world. Those who fondly remember Tea With the Black Dragon will find some themes in common, but they are very different books. If one insists on placing it in a genre category, it’s fantasy. I should probably admit, in a spirit of full disclosure, that I feel that R.A. MacAvoy hasn’t written nearly enough. I’m not previously familiar with Nancy Palmer, but regardless of any other contribution she made, another MacAvoy novel is something to be grateful for. Go read it; you won’t regret it. I received a free electronic copy of this book in exchange for an honest review. This entry was posted in Book Reviews and tagged Lis Carey, Nancy Palmer, R. A. MacAvoy by Mike Glyer. Bookmark the permalink. Yay! Thanks Lis and Mike! I think this one will have to go onto Mount File770. Oo! $2.99 on Amazon Kindle US. I need to stop reading File770 until my TBR stack is less than a yard. 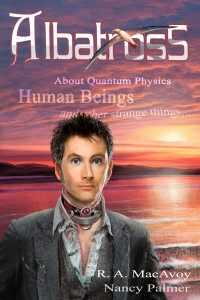 lol, surely that’s David Tennant on the cover. Hey, great idea to add book reviews! Is this just a one-off, or will it continue? And (she suggested slyly) can anyone participate? Actually, there was so much to and fro-ing about the cover picture it came to either shrink in the wings of the bird or the ears of the man. (Maurizio’s a real artist) and I, for one, really liked the version with the spread-out wings. So I guess I’m at fault. Isn’t Tenant all beardy, anyway? It’s a great cover. I’m so happy to have read the book! I was taught I wasn’t supposed to say thanks for reviews. So what do I say? It looks remarkably like my last supervisor. Ms MacAvoy: I started corresponding with my husband-to-be because of “Lens of the World”. So thank YOU. Bertie MacAvoy: I was taught I wasn’t supposed to say thanks for reviews. So what do I say? Cally, I started corresponding with my husband-to-be because of a story HE wrote. everything goes in circles. Now, you write one and see what happens. I am almost as charmed by this nickname as by “Tea With the Black Dragon”. Thanks to Lis for the review! I’ve downloaded the sample. As the character is Scottish and from the Hebrides, he might be distantly related to Mr. Tennant (ne MacDonald), thus the resemblance. I’m delighted that someone understood what we were trying to do with this novel. Thank you for your nice feedback. I’m Bertie. Always was. R.A. is a pseudonym. Although once someone followed me down a hall shouting RA, RA, as though I were an Egyptian god. Hey, Bertie, if they’re willing to give you gold, don’t disillusion them! Last weekend I discovered “Book of Kells” due to a thread here, and thoroughly enjoyed it. Don’t know why I had somehow managed to miss up to now. Was really excited to see this review when I checked out File 770 this morning! I may have been a bit late to work today, ahem. Also $2.99 at Kobo (DRM-free*) and iTunes. * It’s probably DRM-free at iTunes, given it is at Kobo. BTW re. the cover: I like Maurizio Manzieneri’s artwork; this cover is great (despite and/or because of the resemblance to a certain actor). Kendall, ANYTHING Maurizio does is splendid. Search him out – the images go on and on and on . . . The only difficulty is to convince him one doesn’t want a particularly beautiful image for THIS part. He flies to beauty like a moth around a candle. I love reading everyone’s stories about Bertie’s books! The Book of Kells is one of my favorites, but I’ve never read anything like Lens of the World and its successors. I read it mumblety-mumble years ago. Nazhuret remains one of my favorite characters in literature. I have had an amazing time working with Bertie. If you’d like more info on the “making of” Albatross, or to chat with Bertie and me about literature, the salvation represented by libraries, and the proper way to make porridge, you can join the conversation over at ramacavoy.com. You can also see the covers Maurizio’s done for some of her past works. Really beautiful pieces. My son (and his hair) will appreciate the David Tennant comments; the 10th Doctor is one of his favorite cosplays. I will just say that Tea With the Black Dragon remains a warm, bright glow in my heart.